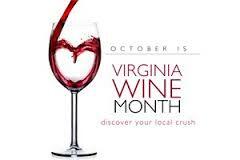 October is Virginia Wine Month. What a great time of year, cooler weather, changing leaves, and the harvest. There are over 200 wineries in our great state and 31 days in October, so get out and explore, taste, save! Doukenie Winery: Bistro Night 6-9. Enjoy live music, food vendors on-site, and great wine.